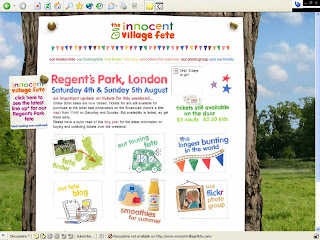 Innocent Drinks headline sponsored / organised an outdoor event called 'the Village Fete' in Regents Park, London this weekend. 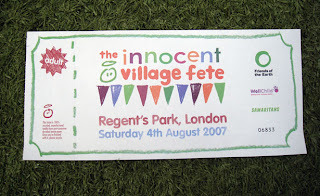 Innocent had prominent branding at the Village Fete and the only non-alcoholic drinks available across the site were from Innocent. Through a combination of little touches and clever ideas the Innocent Village Fete was designed to enhance Innocent's brand values - but most of all the event was fun! 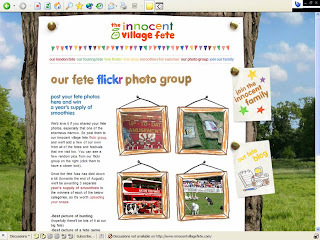 The Innocent Village Fete was not just a physical event, it was also well developed online. 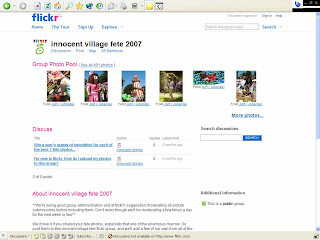 The main website was at http://www.innocentvillagefete.com, with further online presence leveraged through social media at the Innocent Village Fete blog and the Innocent Village Fete Flickr Group which can be accessed through http://www.innocentvillagefete.com/photogroup.php or http://www.flickr.com/groups/innocentvillagefete2007 . The electic mix of events (duck herding through to acoustic performers) were fun and mischievious and the online activity around the weekend was also engaging. The behind the scenes blog was interesting and creating a Flickr site for attendees to upload photos is a clever way of interacting with customers. We really enjoyed the event, look forward to next year and hope the man in the film below returns too ;-)!